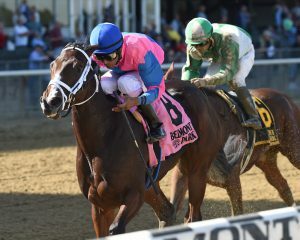 Berning Rose (Freud) turned in a strong winning performance in the $250,000 Maid of the Mist for 2-year-old fillies, the first of the eight New York-bred stakes races on Empire Showcase Day 2017 at Belmont Park on Saturday. 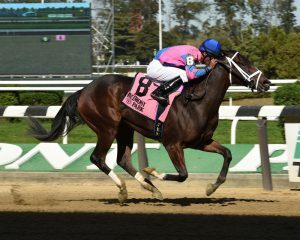 Trained by Dominick Schettino for owners/breeders Robert D. Rosenthal and Bradford H. Bernstein, Berning Rose broke her maiden at first asking going gate-to-wire in a seven-furlong tilt at the Spa on August 30 as the longest shot on the board. Three weeks later, the dark bay filly finished a willing second to Broman homebred Held Accountable in the Joseph A. Gimma, when outfinished by the winner to the outside while she closed gamely at the fence. Exchanging the rail for the outside post in the Maid of the Mist and sent off at odds of 7-1, Berning Rose and her jockey Kendrick Carmouche acted like they were “in it to win it” from the bell. Springing out of gate to assume the early lead, Berning Rose then settled professionally in fourth position, while speedsters to her inside – Newport Breeze, I Still Miss You and 4-5 favorite and Grade 2 Adirondack winner Pure Silver – gunned their way to the front to battle for the top spot. 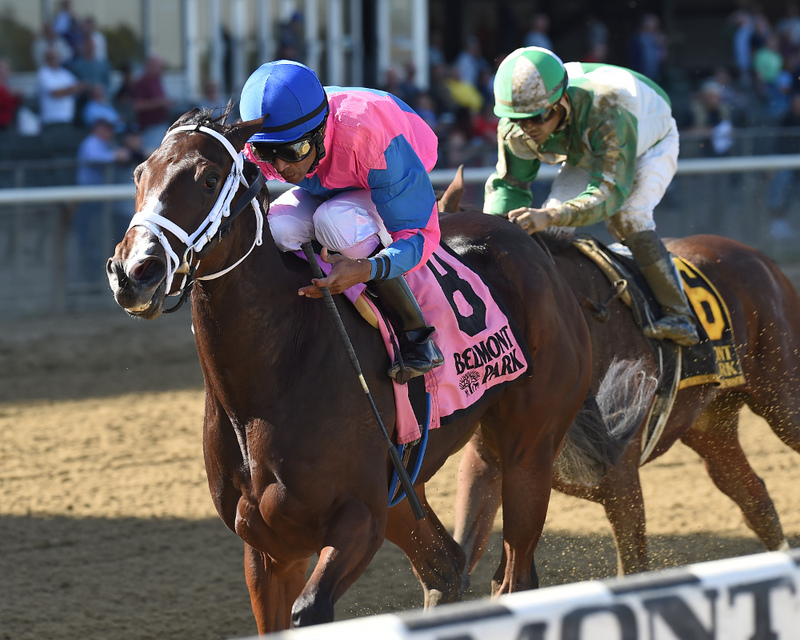 Attending the pace four wide through an opening quarter in 22.84 and half in 45.99 along the backstretch, Berning Rose came in a path in the far turn and, as Pure Silver dropped out of the pace-duel, accelerated past the remaining duelers rounding the bend. Berning Rose passed the quarter pole in front and in control, but wasn’t home free yet. Her nemesis from the Gimma, Held Accountable, was launching a strong closing bid from midpack to her outside, and was closing the gap. Carmouche, Berning Rose’s regular jockey, reported that, from the way he prepared the filly, all went pretty much as planned. 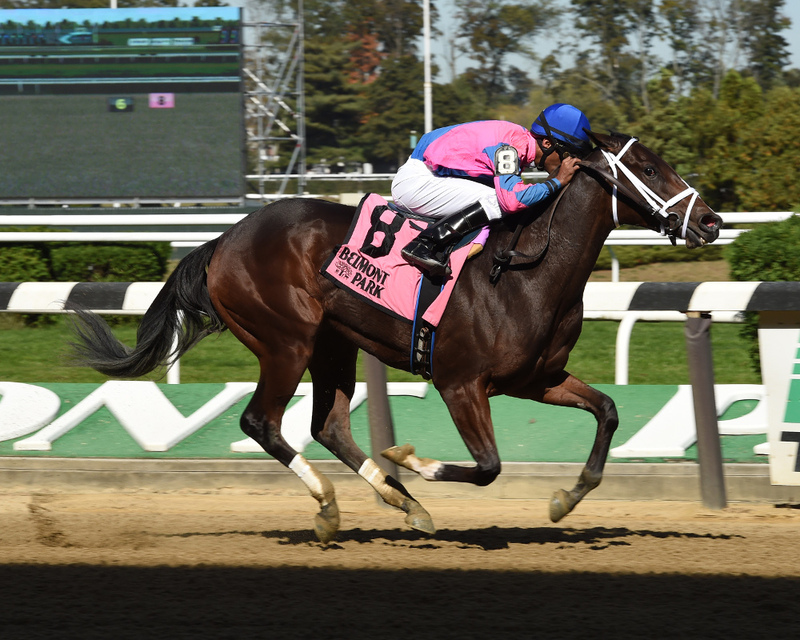 Berning Rose, who has earned $223,800 from two wins and second and was foaled at Jan Durrschmidt’s Indigo Farm near Stanfordville, is one of four winners from four foals to start out of Peach Flambe, a Florida-bred multiple stakes winner by Flying Chevron. She is the first stakes winner for her dam, who has a yearling filly by Alpha, a weanling filly by Normandy invasion and was bred back to Alpha this year.